I was never a big fan of MIDI guitar, but that changed when I discovered two guitar-like controllers—the YRG1000 You Rock Guitar and Zivix Jamstik. Admittedly, the YRG1000 looks like it escaped from Guitar Hero to seek a better life, but even my guitar-playing “tubes and Telecasters forever!” compatriots are shocked by how well it works. And Jamstik, although it started as a learn-to-play guitar product for the Mac, can also serve as a MIDI guitar controller. Either one has more consistent tracking than MIDI guitar retrofits, and no detectable latency. The tradeoff is that they’re not actual guitars, which is why they track well. So, think of them as alternate controllers that take advantage of your guitar-playing muscle memory. If you want a true guitar feel, with attributes like actual string-bending, there are MIDI retrofits like Fishman’s clever TriplePlay, and Roland’s GR-55 guitar synthesizer. In any case, you’ll want to set up your MIDI guitar for best results in Studio One—here’s how. MIDI guitars usually offer Poly or Mono mode operation. With Poly mode, all data played on all strings appears over one MIDI channel. With Mono mode, each string generates data over its own channel—typically channel 1 for the high E, channel 2 for B, channel 3 for G, and so on. Mono mode’s main advantage is you can bend notes on individual strings and not bend other strings. The main advantage of Poly mode is you need only one sound generator instead of a multi-timbral instrument, or a stack of six synths. In terms of playing, Poly mode works fine for pads and rhythm guitar, while Mono mode is best for solos, or when you want different strings to trigger different sounds (e.g., the bottom two strings trigger bass synths, and the upper four a synth pad). Here’s how to set up for both options in Studio One. Figure 1: Check “Split Channels” if you plan to use a MIDI guitar in mono mode. To use your guitar in Mono mode, check Split Channels and make sure All MIDI channels are selected (Fig. 1). This lets you choose individual MIDI channels as Instrument track inputs. For Poly mode, you can follow the same procedure as Mono mode but then you may need to select the desired MIDI channel for an Instrument track (although usually the default works anyway). If you’re sure you’re going to be using only Poly mode, don’t check Split Channels, and choose the MIDI channel over which the instrument transmits. Note that you can change these settings any time in the Options > External Devices dialog box by selecting your controller and choosing Edit. For Poly mode, you probably won’t have to do anything—just start playing. With Mono mode, you’ll need to use a multitimbral synth like SampleTank or Kontakt, or six individual synths. For example, suppose you want to use Mai Tai. Create a Mai Tai Instrument track, choose your MIDI controller, and then choose one of the six MIDI channels (Fig. 2). If Split Channels wasn’t selected, you won’t see an option to choose the MIDI channel. 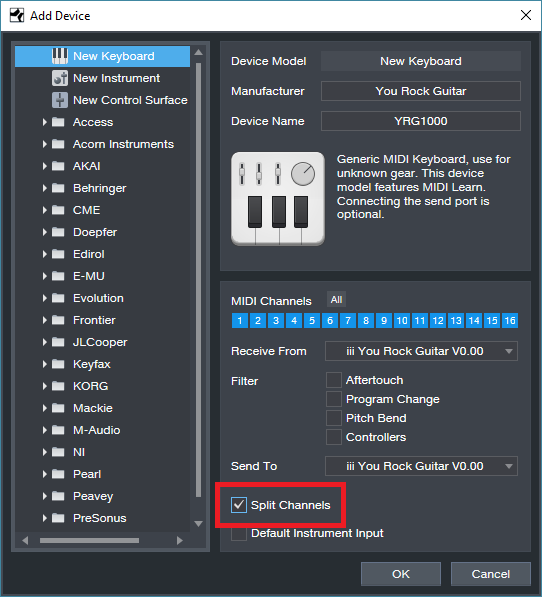 Figure 2: If you chose Split Channels when you added your controller, you’ll be able to assign your instrument’s MIDI input to a particular MIDI channel. Next, after choosing the desired Mai Tai sound, duplicate the Instrument track five more times, and choose the correct MIDI channel for each string. I like to Group the tracks because this simplifies removing layers, turning off record enable, and quantizing. Now record-enable all tracks, and start recording. Fig. 3 shows a recorded Mono guitar part—note how each string’s notes are in their own channel. 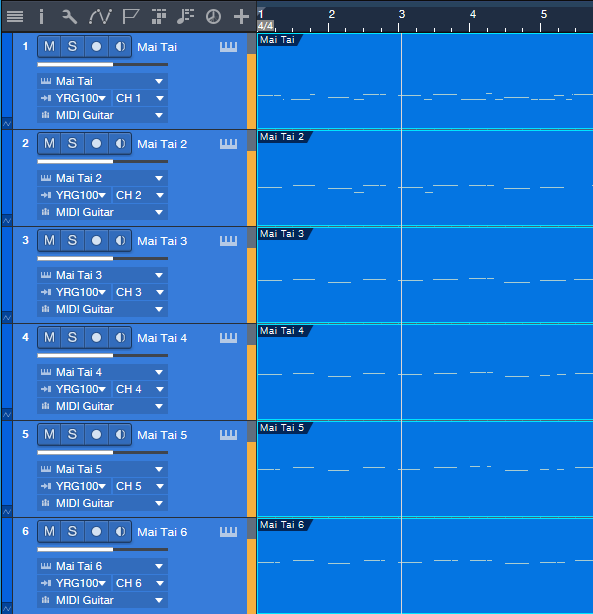 Figure 3: A MIDI guitar part that was recorded in Mono mode is playing back each string’s notes through its own Mai Tai synthesizer. To close out, here are three more MIDI guitar tips. In Mono mode with Mai Tai (or whatever synth you use), set the number of Voices to 1 for two reasons. First, this is how a real guitar works—you can play only one note at a time on a string. Second, this will often improve tracking in MIDI guitars that are picky about your picking. Use a synth’s Legato mode, if available. This will prevent re-triggering on each note when sliding up and down the neck, or doing hammer-ons. The Edit view is wonderful for Mono mode because you can see what all six strings are playing, while editing only one. MIDI guitar got a bad rap when it first came out, and not without reason. But the technology continues to improve, dedicated controllers overcome some of the limitations of retrofitting a standard guitar, and if you set up Studio One properly, MIDI guitar can open up voicings that are difficult to obtain with keyboards. 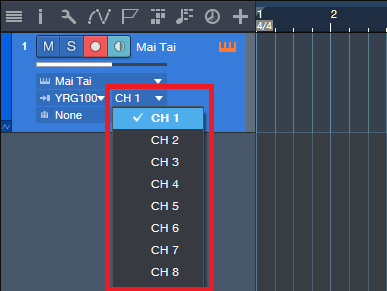 In Cubase you simply just select the option “Any” instead of a specific channel. Cubase fix the rest that’s why it’s the best DAW ! It’s no point if it’s not multitimbral when you use a guitar type controller like the SynthAxe ! I use Melodyne Editor for software-based guitar to MIDI, and it works well. Of course unlike a hardware controller, it’s not real time. Off track, but any pointers on setting up Jam Origin? I can’t get it to track my Guild S-60D at all. One day after I finish setting up my MIDI guitar. ONE. DAY. Actually, nice notes, thanks. Popped in to mention the Casio MG-510 MIDI guitar. It requires a MIDI interface, of course, and I set mine up with a Roland UM-2G. Otherwise set up is the smae. I’ve been using Jam Origin https://www.jamorigin.com/download/ with my Les Paul. After some tweaking it tracks very well. To set it up follow this video https://www.youtube.com/watch?v=j6OqZi-qxAY. There are some artifacts that popup in the midi file but I seem to be able to control most of it with how I play my guitar. It takes some adjusting but once you get it dialed in, it works very well. Another thing that helps is sometimes I use cloth like a headband wrapped around the first fret to stop some of the open string resonance. You still have to send those channels to individual instruments…not all synths are multitimbral. I’m among those who choose to use Poly mode for MIDI guitar. This goes back to the days of my first controller, a Yamaha G10. Managing MIDI data through the small LCD of an Alesis MMT8 was a disincentive to editing six channels of notes and controller information. Odd to say that as a guitar player, I was never interested in guitar technique but rather recording piano, organ, cello, and bass MIDI data into a sequencer and now, DAW. – Assessment: Record a passage to determine the highest low velocity false triggers for a given controller such as the venerable Roland GI-20 or the FTP. – Insert the Note Fx>Input Filter and adjust the low velocity to filter out notes below that threshold. Recording are now much cleaner. – Action>Select Notes>Note Length>Select Range. 0 to 32nd note works well for me to select false triggers. Once selected, delete them. – Action>Select Notes>Velocity>Select Range. 0 to 10% works well here. It’s very easy to scroll the velocity bars to match low velocity notes to the velocity meter below the editor to determine the %. – While it’s tempting to consider a Macro for these actions, the issue is that some short notes may have high velocity, and some long notes have low velocity. It’s tricky! A List Editor in S1 to quickly assess the notes would be a god-send!!! On a side note, “The Complete Guide to the Alesis HR16 and MMT8” and “Electronic Projects for the Musician” are still on my book shelf. Oh, and there’s a storage box loaded with PAiA kit compressors, EQs, and the Quadrafuzz. This is sooo complicated especially if you compare it to Cubase ! In Cubase to use a Mono mode guitar controller you just choose “Any” in the channel section and Cubase takes care of the rest !